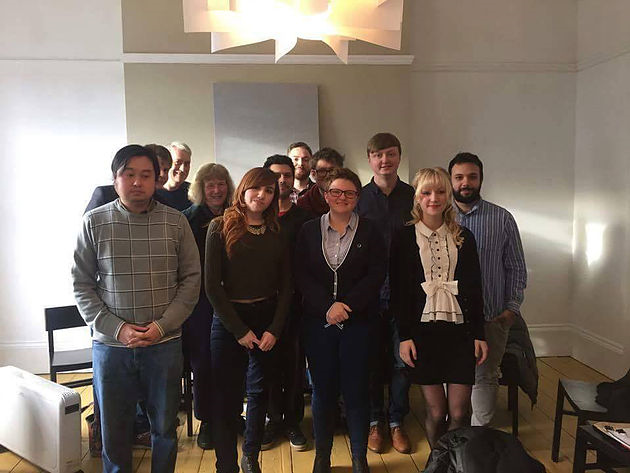 I have interviewed Tom Miller for Scicomedia (pictured above with group) Councillor for Willesden Green, London, about the Labour Party and his political forum, Open Labour: a group that advocates for a modern and socialist Labour Party. Tom Miller: “We do think that out of government there is a closing occurring, yes. There are a lot of criticisms which can be made of New Labour, but fundamentally, it was trying to respond to a world where there was, for instance, a lot less large-scale manufacturing or primary industry than there was in the 1970s; understanding a changing economy and trying to change with it. “Ideas like challenging the market with democratic alternatives should be common ideas to our whole party, including ‘moderates’. It’s a big part of what we are here for, because we know markets without direction or limits stop people from being free. As well as (hopefully) making internal democracy more real and full, Jeremy’s victory shows that this is where party members want us to be, and a lot of that agenda polls well as well. If it forces Labour’s right to adapt towards a more consensus position in the party, that’s good news for the party in the long term. “There are quite a few downsides. Are we too far from the prevailing consensus or model of leadership to challenge it effectively? This would be a contradiction at the heart of the project. We seem a little adrift in terms of having a strategy. Who do we want to convince. What for? Who do we need to speak to if we are to win in 2020? “This is a more general issue and also speaks to Labour’s apparent unwillingness to try to ‘insulate’ itself from political attack, by either the Tories directly or their press friends. The thinking at present is very gung-ho: ‘We will be attacked anyway, why bother protecting ourselves?’. This is like casting aside our armour because there will be arrows, and our thinking could do with being a bit more sober and realistic. Is our strategy genuinely aimed at succeeding? “Quite a lot of people on what was traditionally the ‘hard’/Bennite left have made statements for years which they never expected to have held to account or put to the test of mainstream opinion and support. There needs to be a concerted show of effort in putting this kind of ‘non-seriousness’ aside, which would be much more successful than relying on ‘straight talking’ alone. Simply saying what we think when we like is not a strategy, is not supported as one by any kind of evidence, and won’t win the change we need. “The last downside is not Jeremy’s fault, but comes with the package. The UK political left as a whole seems to be moving away from a collective and democratic way of thinking towards one focussed heavily on short-term fads: ‘take the product I like’ political consumerism, and ‘leader’ figures. Jeremy is more substantive than this, but elements of all of those things went towards his support, and people are applying them to internal politics now — for example by making support for Jeremy the person the ‘test’ of leftism. This should be rejected. Stephane Savary: “What about the Young Labour Conference in Scarborough? Overall, it was a PR disaster with accusations of racism and smearing campaigns against young labour activists. During the Conference, Mo Ahmed said that the Labour Party was taking BAMEs for granted. Do you agree with him? Tom Miller: “I’ve actually seen very few, if any examples on the Labour left, but I’ve seen a lot of ‘pro-Palestine/anti-Israel’ activism outside Labour and I’ve seen plenty. Therefore there is definitely a risk of that kind of attitude ‘seeping in’ and I think we need to do more to guard against it — it’s not taken sufficiently seriously because for now the infection seems to be limited to the far left outside the party. “There are basic things that activists need educating on. How many young activists with an interest in the issue accurately understand what ‘Zionism’ is for example, and that it includes peace activists who have rocks thrown at them by Israeli expansionists? How many have an understanding of very basic anti-racism, for example that Jews are not accountable for Israel’s actions? How many can compute that whilst this is true, Israel is important to many people’s Jewish identity, and that’s not really to question? Stephane Savary: “US elections: I am sure that you follow the presidential elections. Between Hillary Clinton and Bernie Sanders, which candidate is politically closer to Open Labour? Tom Miller: ”Yes, it’s going well! We’ve also made a press splash and gained over a thousand supporters across the country who seem to be highly engaged. We have a first meeting of our steering group in Birmingham which has now become an official ‘Management Committee’. We have some startup things to do first, but eventually this body will be elected. We’ve also recruited a team of voluntary regional organisers, so we have another meeting organised with Jon Trickett in Sheffield. There will be a range of others to follow these, with some initial thinking going on for South Wales, the West Midlands and the North East.